Patia Davis was invited to join the workshops at Wobage in 1991 following graduation from Cardiff and previously Harrow Studio Pottery Course. Her gentle porcelain forms evoke a sense of quiet and calm. It is the beautiful smoothness of the thrown material which emphasises the directness of the maker’s touch; hand against rib, inner tension with lift and softness of rim. With crispness, fluidity and care in the making, these qualities are relinquished to the glazed pot upon firing, captured underneath the subtle pale hues of transparent glaze. The porcelain is bisqued and then gas-fired to 1300C. The warm, rich colours and strong forms of Patia’s domestic earthenware pots reflect her motivation towards utility and the joyful role that these pots play from kitchen to table. 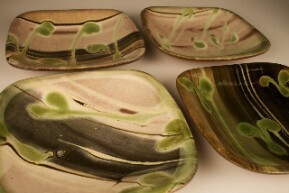 They are raw-glazed and once-fired to 1120C. Not unlike the rural English terracotta potters of earlier centuries, Patia’s creative response to living and making evolves steadily and confidently. Her deft lightness of touch on the wheel and the influence of the natural world surrounding her home and workshop, brings a contemporary edge to a range of pots which also assert a deep respect for tradition. For further details and information, here’s a link to Patia’s own website. For evening class bookings for Mondays and Wednesdays, contact Patia via her e-mail: patia.contact@googlemail.com or by telephone?! : 01594 …..